Something I've been trying to find out for a long time now is where exactly Andre the Giant died in Paris. For those of you who aren't familiar with Andre (is this even possible? ), André René Roussimoff was born in Coulommiers, France, in 1946. He had acromegaly, a type of gigantism, caused by a pituitary tumor that produced excess growth hormone. Andre grew to be 7 feet, 4 inches (2.24 m) tall and weigh 540 pounds (240 kg). Andre began his professional wrestling career in Paris while still in his teens, and was later discovered by the World Wrestling Federation (i.e. the WWF, later renamed the WWE), who brought him to the United States. Andre went on to become one of the most famous and beloved pro wrestlers in history, and something about his charisma and oddness really struck a chord with young kids in the 1980s, like me. My generation absolutely adored Andre, and we still do now that we're grown up, as is evidenced by the "Andre the Giant Has a Posse" movement that started out as a street art campaign in the 1990s and grew into a hipster marketing empire in the 2000s. Now, what's all this got to do with a website about weird stuff in Paris? Well, Andre died in Paris on January 27, 1993. I still remember very clearly being shocked by the news as a teenager, and the sad details of his death stuck with me: Andre had been in France to attend his father's funeral, and a few nights later he died in his sleep in his hotel room in Paris. A little bit of research tells me that he was found the next morning by his chauffeur, and that the autopsy showed that Andre died of congestive heart failure related to his acromegaly; it's very tempting to believe that his big heart gave out partly due to the stress and sadness of losing his father. I've been trying to find out which hotel Andre died in for ages, and I never seem to make any headway in the matter. 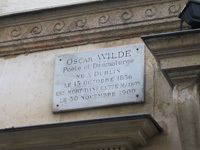 I'd love to be able to visit the spot, at least to see the front of the hotel, much like tourists seek out the hotel where Oscar Wilde died, to read the little plaque, take a picture, or just stand there for a moment and think about the man. I'd like to be able to do the same with Andre, wherever that hotel is (although I doubt they have a plaque, ha!). And I'd love to be able to share that info with the visitors of this site. I can't think of many things that would be more Weird and Cool than that. So if you know anything, please e-mail me! Thanks! Update! A few readers have sent me this link that says that Andre died at Hôtel de la Trémoille (map) in the 8th arrondissement. Finally, mystery solved! I look forward to checking it out. Thanks, guys! One other amazing thing that I can't not mention while we're on the subject of Andre the Giant and France: When Andre was a giant preteen kid in rural France, he was driven to school every day by Irish playwright Samuel Beckett! Beckett happened to be Andre's family's neighbor, and he sometimes played cards with Andre's dad. Poor Andre couldn't fit in the local school bus, so Beckett volunteered to drive him to school in his truck. Google it; you can find lots of neat versions of the story. It's absolutely delicious to imagine Andre and Beckett hanging out. I'm still waiting for a Hollywood action movie with the two of them solving mysteries and barroom brawling with French fieldhands or something.